Authors: Megan Bedell, Jacob L. Bean, Jorge Melendez et al. First author’s institution: Department of Astronomy and Astrophysics, University of Chicago, USA. 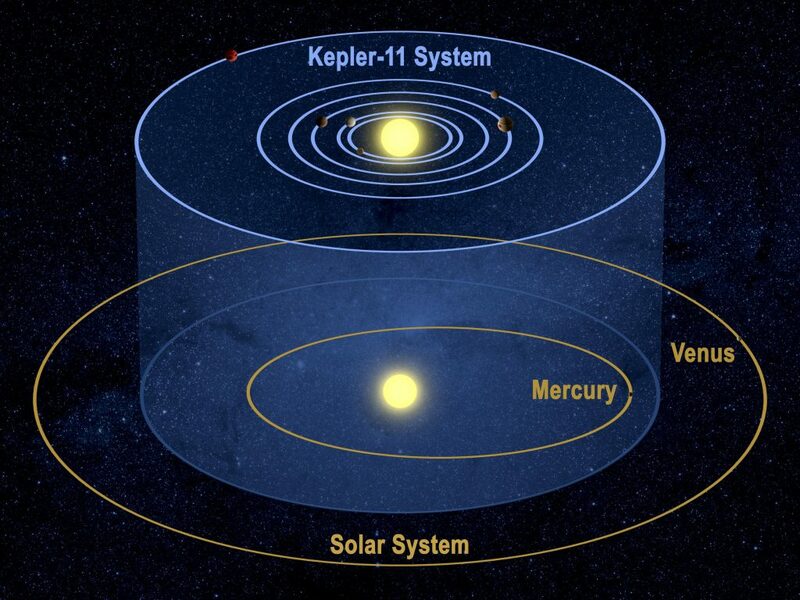 Figure 1: Artist’s schematic of the Kepler-11 system, compared with our own. Six planets tightly orbit a star, which today’s paper reveals to be almost identical to the Sun. Image credit: NASA. The current tally of known exoplanets stands at around three thousand, depending on who you ask. Among the hundreds of stars that these planets orbit, Kepler-11 is a standout case (it even has its own Wikipedia page). Kepler-11 has six planets, five of which would comfortably fit inside the orbit of Mercury (Figure 1). What’s more, all of the planets have remarkably low densities for their size. The tight orbits and low densities are contradictory: the planets must have thick gas atmospheres, but the star should have blown away all of the gas that close before the planets could form. As the planets are there despite this, the system provides an excellent test bed for planetary formation models. Today’s paper presents new observations of the central star of the Kepler-11 system. As nearly everything we know about exoplanets comes from measuring their effects on their host stars, detailed observations of those stars are necessary to fully understand the planets. Due to its faintness, however, previous observations of Kepler-11 are poor. To remedy this, Bedell et al. turned to one of the largest telescopes in the world, the twin ten-metre Keck telescopes on Mauna Kea, Hawaii. Over two nights, Keck stared at Kepler-11, along with nine stars that the authors thought might be similar to it. The telescopes produced spectra, splitting the light of each star into a rainbow of colours, complete with distinct imprints left by the chemicals in the stars’ atmospheres. As a comparison, the authors also obtained a spectrum of the Sun, using the light reflecting off the dwarf planet Ceres to avoid burning out the telescope. Figure 2: Spectrum of Kepler 11, the Sun and one of the comparison targets. The bottom plot shows the differences between the spectra of the two stars and the Sun. In both plots, the near-match of Kepler-11 and the Sun can be clearly seen. Figure 1 from Bedell et al. The results showed that Kepler-11, despite having a planetary system utterly unlike the Solar system, is nearly identical to the Sun. Careful analysis of the spectrum showed that Kepler-11 and the Sun have almost exactly the same temperature, mass, and atmospheric chemistry. Bedell et al. point out that, unusually for spectra, the result can be seen by eye. 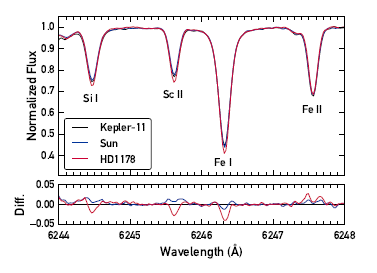 Figure 2 shows the spectra of Kepler-11, the Sun and a comparison star, with Kepler-11’s line nearly tracing over the Solar spectrum. Kepler-11 is therefore placed firmly in the category of star known as “solar twin”. It isn’t quite an identical twin, being slightly younger and with a slightly more metal-rich atmosphere, but it’s very close. These twins are extremely useful for exoplanet studies, as comparing their planetary systems to our own can guide how we apply the lessons learnt about the planets here to more distant worlds. With that in mind, where do these new observations leave Kepler-11’s intriguing planetary system? As the mass and radii of the planets are measured in relation to the star, the new results for Kepler-11 mean that the planets’ characteristics also need revising. The authors find that the planets all must have higher masses than previously thought, as well as smaller radii. This means that the densities of the planets are about 30 percent higher than previously thought. They therefore need less gas to form, making their formation so close to the star a bit more believable. With the deluge of planet discoveries set to continue for years to come, Bedell et al. finish by pointing out the need for similar, high-quality studies of the stars of all of these new worlds. 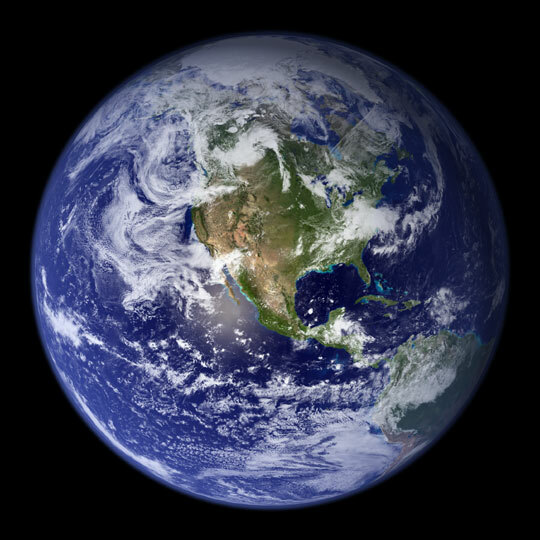 The Colors of a Second Earth Water found in remains of planetary system around a white dwarf Cloudy with a chance of Carbon Monoxide Sustainable Climates on Greenhouse Super-Earths? Let’s see, we hot Jupiters and migrating Jupiters so why not Jupiters swallowed by there sun, which leaves a bunch of left over moons from the now bygone Jupiter that are puffed up because they formed further out from the sun where the migrating Jupiter was originally formed! So we need to look for the remnants of the Hot Jupiters in the chemical make up of these stars, that sounds like a good project for you – Mr. David Wilson.